How to Enjoy Mt. Fuji Climbing, Art, and Religious Mystique. Please imagine that if it were not for Mt. Fuji, what would be a symbol of Japan? Of course, the country is blessed with uncountable natural beauty and attractive sightseeing spots. However, Mt. Fuji has an incomparable presence. Apart from the exact knowledge of the location, I think every people in the world know of this beautiful mountain. The scene that snow covers the summit is familiar to us, but it melts in summers and seeps into the ground. Well, it is not permanent snow. When summer comes, you can climb to the top of Mt. Fuji. Anyway, to change the appearance of Mt. Fuji in winter into in summer, I use the Aladdin lump. Please grant my first wish that I would like to see Mt. Fuji without snow! Copyright (C) フリー素材タウン All rights reserved. Wow, magical power really changes a winter’s Fuji into summer’s one. Look! The snow melted and disappeared. As we can see the appearance (Image 2), it is the best season to clime Mt Fuji from the middle of July to the beginning of September. It is recommendable for you to go on weekdays because it is so crowded with climbers on holidays and during the Bon vacation (The middle of August). This is far from enjoying climbing as the Image 3. To go for the top of Mt. Fuji at height of 3,776-meter (12,388 feet), careful preparation is required. At the very beginning, your belongings have to be completed. The weather on the mountain is variable as women’s feelings. Depending on climbing routes, it takes at most 10 hours to the summit and back. Indispensable goods are a raincoat and parka protecting you from rain and coldness. Needless to say, a backpack and climbing shoes are absolutely necessary. In preparation for descending the mountain after nightfall, flashlight affixed to your head is an ideal item just in case. It is the most important that you prevent yourself from getting wet and losing your body’s heat by the rain. About two litters of water are necessary for altitude sickness prevention. Sweet chocolate gets rid of your fatigue. There are four climbing routes in Mt. Fuji. The first starting point I introduce is “Fuji-Yoshida-Guchi” at a height of 2,300m (Approx. 7,500 feet). In this route, available are many shops and mountain cabins including two aid stations. The easier accessible this route is, the more crowded tourists are during peak days. The second is “Fujinomiya-Guchi” at a height of 2,400m (Approx. 7,900 feet). Compared with the Fuji Yoshida-Guchi, this route is less enough facilities. However, weather permitting, the biggest draw is to overlook the Pacific Ocean. The third is “Gotenba- Guchi” at a height of 1450m (Approx. 4,760 feet). This long distance gives you unexpected merits that the number of climbers is very smaller than that of other routes. However, it is necessary to stay overnight at any cabin along the way. It is not recommendable for beginners. Other route which is not run in the Image 4 is “Subashiri-Guchi”. The distance is shorter than that of Gotenba-Guchi, but you have to walk in forest zone until the 7th station. Congratulations! At last you reach the summit of Mt. Fuji. 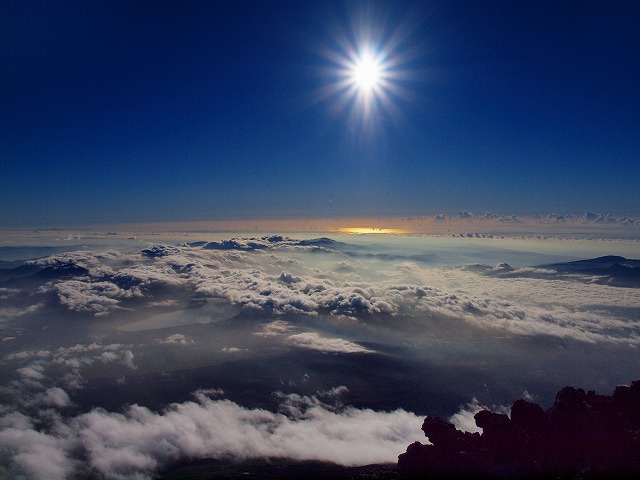 The image 6 is the sunrise which is seen from the top. The great, breathtaking, and overwhelming beauty will always be your lifetime memory. This is the crater of Mt. Fuji and a hill over there is a summit-level “Kenga-Mine”. If you are confident in your physical strength, making a circuit of the eruptive crater is an interesting choice. In this regard, however, I hope you remember that the full circuit takes you about two hours including climbing the summit-level named “Kenga-Mine”. This course features grandstand and vigorous Mt. Fuji as a volcano, but please consider whether you still keep your stamina to descend the mountain. Discreet decision is required for taking this action. Again, I use the Aladdin lump. Please grant my second wish that, from the summit here, let us take an art museum featuring Mt. Fuji. In an eye’s blink, we stand at the front of a museum. Needless to say, the splendor of Mt. Fuji is not limited to climbing. It has long had strong influence on Japanese paintings and poetry. The most famous ukiyo-e works derived from the mountain is “Thirty-six views of Mount Fuji” painted about two hundred years ago by an ukiyo-e artist, Kastushika Hokusai. Of thirty six works, the image 10 named “The Great Wave off Kanagawa” depicting the Fuji between big waves is a representative work. The work of “Red Fuji” is not a deformed expression. When several weather conditions converge, this phenomenon really appears on rare occasions. This series include many angles of the Fuji from numerous locations and in various seasons and had a big impact on non-Japanese artists like Gogh. You can appreciate the wonderful series of thirty six works in the Wikipedia. How serviceable! In modern days when photographic technique is sophisticated, interesting expressions like an inverted image of Mt. Fuji reflecting on the lake (Image 12) or a shadow cast by Mount Fuji on a cloud sea (Image 13) can be appreciated. The combination of the poles to the left is the gateway to a Shinto Shrine at the summit of Mt Fuji. The red roof building is a rear shrine of the main Fuji-Sengen Jinja located at the foot of Mt. Fuji. The upper right is the topmost height. For readers’ convenience, I use the Aladdin lump because I forgot explaining Japanese mountain worship, and please return to the summit. Oh, we can command wonderful views again. Japan is mountainous and mountain forest accounts for seventy present of the land area. For this reason, mountain worship has long been prevalent as human natural feelings since ancient times. Mt. Fuji itself is an object of worship. Mountains often cause fear such as landslides, snow avalanche, and volcanoes. On the other hand, they offer a variety of benefits like food, lumber and pure water of springs. It is reasonable that ancient people believed in deities in the mountains. This primitive religion and Buddhism practices merge into Japanese original “Shugen-Do” To take various practices, practitioners went deep to the already dangerous mountains where they could go missing. For what? It was because they believed that they could obtain spiritual force after the mortification of the flesh. Today, worshipped mountains have Shinto shrines and attract worshippers. So does Mt. Fuji which is regarded as the deity of the Asama Shrine. (It is also pronounced as Sengen Shrine.) Interestingly, the fields of over 8th station in fact is the private property of the shrine. Please Visit at Least Once-in-a-Lifetime! There is no end to talk about Mt. Fuji. And, I used up the Aladdin lump which grant my three wishes. All I can do is to recommend that you come and look for yourself. There, the wonderful and superb mountain always waits for you. I am sure that you will moved by natural beauty better than you expect. Painting pictures and taking photos are good. Climbing is wonderful! It is difficult to say which is better. However, I can promise you at least one thing that Mt. Fuji will give you something which will be your lifelong memories. in the explanation of climbing tools. Hakone Hot Springs Offer Everything Enjoyable. Experience Three Major Festivals in Kyoto with History Going Back over a Thousand Years! How to Appreciate Ancient Buddhist Temples in Japan. Spot on with this write-up, I seriously believe that this website needs much more attention. I’ll probably be returning to read through more, thanks for the information! as well as brand-new additions.